The Troy Bilt Squall 210 Snow Blower is the smallest gasoline powered snow thrower available from Troy Bilt. It is however a lot more powerful that the Troy Bilt Flurry 1400 Snow Blower. The Squall 210 gets it’s power from it’s 0.12 liter Troy Bilt engine. This engine does not have any type of electric starter system. Instead it is started with a recoil system using a pull cord. This may prove to be a little frustrating for some on very cold winter’s mornings. The fuel tank on the 210 snow blower has a capacity to hold up to 1.9 liters of gasoline. The Troy Bilt Squall 210 snowblower is a single stage machine that only uses an auger to both break up the snow in front of it and to force it through the chute. The auger has a diameter of 0.23 m (9 inches) and is serrated. This then feeds snow towards the center of the machine and where it enters the chute and is thrown away from the clearing area. The chute used on the this snow blower needs to be rotated manually. The total clearing width of the Troy Bilt Squall 210 snow blower measures 0.53 m (21 inches) and it has an intake height of 0.25 m (10 inches). This is usually a large enough size for most people with small to medium sized driveways. When buying the Troy Bilt Squall 210 snow thrower new, you will get it with a 2 year warranty if you will just be using it personally and not for commercial operations. 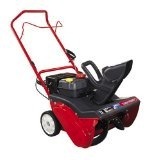 All in all, this 21 inch snow thrower from Troy Bilt is a very good entry level model for anyone who wants to keep their driveway and paths clear during the winter. Click Here to buy the Troy Bilt Squall 210 Snow Blower.